Aerial view of the site of 'Beaconsfield', 2012. Bramhall Lane runs close to the left-hand side of the the view; The Mormon Church and 'Reinbek' are in the centre. Thomas Leigh (senior) was born c. 1784 in Chapel-en-le-Frith, Derbyshire and died 12 November 1858. 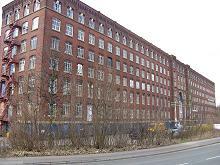 In 1850 his son Thomas Leigh (junior) and his brother James Leigh founded the cotton-spinning firm of Thomas and James Leigh based in Portwood, Stockport. Stockport is often associated with hat-making, but cotton spinning, turning raw cotton into thread for weaving, was its major employer for many years. Spinning mills, by comparison with other textile factories, are often very large multi-story structures. By 1872 the Leighs were operating the Beehive and Hope Mills in Portwood; the Beehive mill was actually a group of buildings, including the Alligator Mill, a six-storey building which appears in the background of many pictures of trains at Tiviot Dale station. Neither the mill nor the station exist in 2013, replaced by a motorway and a Tesco store. Thomas Leigh died in 1857, and by 1888 the partners in the firm, by then styled 'T & J Leigh' were James Leigh, Joseph Leigh, William Leigh and Isaac Linney Leigh. Joseph Leigh left in that year to concentrate on his political career. In 1880 T & J Leigh commissioned a completely new mill, designed for the spinning of both cotton and wool. 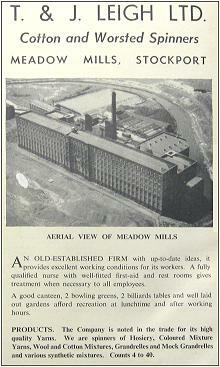 Christened Meadow Mill, this impressive double mill continued in operation for many years. In 1960 the firm of T & J Leigh ceased trading, but a new company continued to spin carpet and worsted yarn until 1969. Since then the building, seen above in 2013. has functioned an industrial estate, housing many businesses including, at the time of writing, Omega Auctions, often featured in the media for its auctions of musical memorabilia. John Rusby was born about 1767 and died in May 1845 in Glossop, Derbyshire. 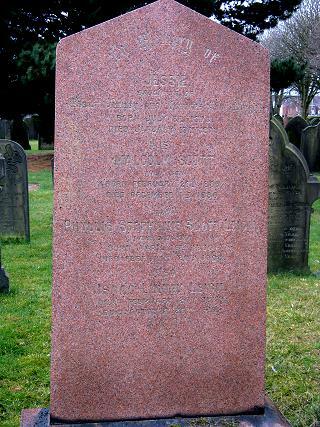 He was married to Anne Bradbury who was born about 1774 in Derbyshire and died 27 February 1841 in New Mills, Derbyshire. John and Anne had at least two children: Elizabeth (Betty) Rusby born c. 1799 in Mellor, Derbyshire and died 1857 Stockport, Cheshire, and John Rusby: born c. 1804 in Mellor, Derbyshire and died December 1844 in Glossop, Derbyshire. Mary Ann Linney born 13 October 1825. Maria (Elsie) Linney, born 29 September 1829 in Glossop, Derbyshire and died 15 May 1903 in Cheshire, who married Rev. Robert John Thompson Hawksley, Methodist minister. Isaac Linney Leigh: born January 1848 in Glossop. The 1851 Census reveals three-year-old Isaac Linney Leigh staying with his Aunt and Uncle Hawksley in Buxton. The 1871 census has Isaac Linney Leigh unmarried and still with his family in Hall Street, Stockport, listed as 'Manager of Cotton Mill.' After his marriage in 1877 his mother and sisters, as well as his half-sister Elizabeth, moved to a house in a newly-built row of houses named 'Bramhall Villas' in Bramhall, among the first suburban houses to be built in what was still a rural village at that time. 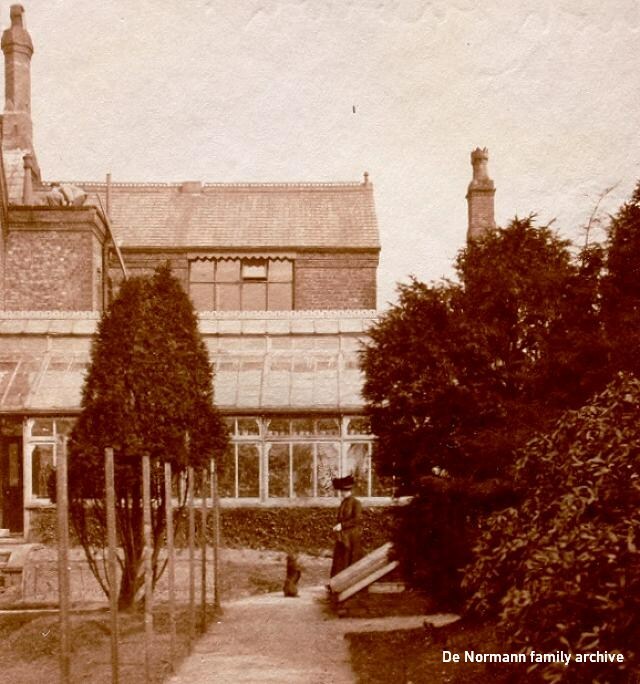 In the 1880s, Maria bought a newly-built detached house called 'Crosscliffe' later known as 37 Bramhall Lane South, immediately to the south of Bramhall Villas, and the sisters moved in there. All these houses have since been replaced by modern apartments. Parthenia died in 1894; Mary Ann died in 1899. Maria continued to live as a spinster at 'Crosscliffe' - the 1911 census shows her living there alone except one servant. She died there on 18 February 1923, leaving an estate worth £10,860 to be administered by her estate agent Samuel Alfred Jepson and solicitor Ernest Barlow. Maria and Pathenia were buried at Brunswich Methodist Chapel in Stockport. Joseph Leigh half-brother to Isaac Linney Leigh, was a major figure in mid-Victorian Stockport. 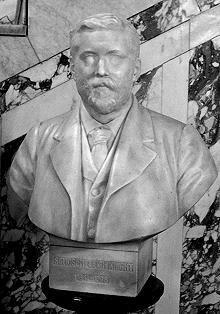 Our picture shows the marble bust of him, by an unknown sculptor, still in place by the main staircase of Stockport Town Hall in 2013, a rare example of public sculpture in the town. In 1875 he was elected as a Liberal councillor for Portwood. In 1884 he was elected mayor, winning a record four years in succession between 1866 and 1868. He was instrumental in the foundation of Stockport Technical School (1897) to which he contributed £3,500 and was Liberal MP for Stockport twice, between 1892 and 1895, and 1900 to 1906. He was a director of the Manchester Ship Canal, as well as several local businesses. In 1889, At Whitehaven, in the English Lake District, Joseph's wife launched a ship which carried her own name Alice A Leigh. It was a four-masted barque owned by the Alice A Leigh Shipping Co. of Liverpool, and capable of an England - Australia voyage in about 100 days. Abandoned in 1930, some remains of this vessel still exist on an island off New Zealand. Sir Joseph (he was knighted in 1894) believed in living in 'style': by 1891 he had moved his household out to the Cheshire countryside to live in 'Tabley House' which he rented from the Leicester family who owned the estate. With seven children, two visitors and fourteen servants, they almost managed to fill a complete sheet of the census return. Tabley House was designed by John Carr of York for Sir Peter Byrne Leicester, Bt., and completed ca.1767 to replace the old family seat, Tabley Old Hall. By 1911 Lady Eleanor Leighton Warren, descendant of the original owner, had moved in with a large retinue; previously she had lived at Tabley Old Hall, but that building became unsafe, party due to subsidence caused by the Cheshire salt mining industry. In 1901, Sir Joseph Leigh the 'retired cotton spinner' could be found at 26, The Promenade, St-Annes-on-Sea, on the Fylde Coast of Lancashire, with his wife, five grown-up children and a still-impressive quota of eight servants. Shortly afterwards, however, he returned to Manchester to live at 'The Towers' in Didsbury, the grandest of all Manchester mansions' according to Pevsner, which his wife Lady Alice Ann Leigh must have inherited from her father Daniel Adamson. Adamson, credited with founding the Manchester Ship Canal company, although he had some connections with the Stockport area, lived in 'The Towers' in Didsbury from 1874 until his death in 1890. 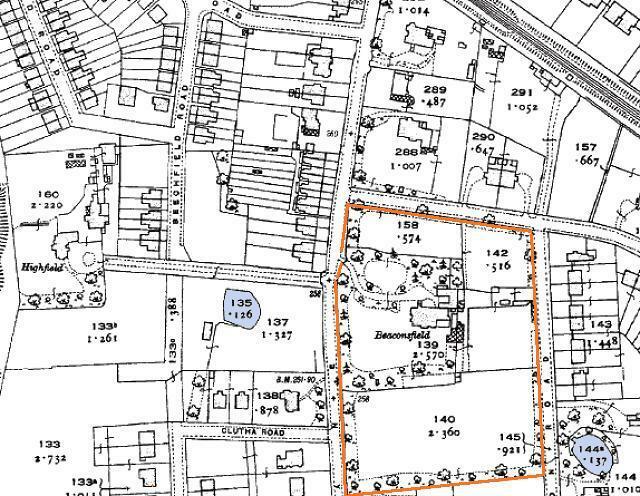 Stockport Council's Conservation Area Appraisal for the Egerton Road / Frewland Avenue area refers to the Mormon Church as built on the site of ‘Beaconsfield’, home of Daniel Adamson, the engineer responsible for the Manchester Ship Canal.' This is incorrect, but there is a family link. Sir Joseph died at 'The Towers' in 1908. He must have retained a connection with Tabley, as the Rev. Canon Symonds, of Stockport and the Rev. A. Symonds, of Tabley, conducted the funeral. Although he was Nonconformist, the interment took place in the burial ground surrounding the old Anglican church in Marple. The list of mourners is a long one, including representatives of all the firms he was associated with, including The Ship Canal, Chatterley Whitfield Colliery, and several others, but not including his half-brother Isaac, for reasons which become clear in the main article. At some time, a cottage was created in the grounds of 'Beaconsfield', perhaps by altering one of the existing outbuildings, and an entrance provided around the corner on The Crescent. In 1901, Beaconsfield Cottage was the home of Henry Wood, recorded as 'Clerk in Bleach Works' his wife Mary and their daughters Hilda, Gladys and Eva Melinda. Henry died in 1902, and by 1911 his widow and daughters were living with Mary's widowed mother Hannah Corbishley at 154 Chapel Street, Edgeley. Photograph from 1931. Is this 'Beaconsfield'? Although it originated in the USA, the Church of Jesus Christ of Latter-Day Saints is by no means a newcomer to Britain, or indeed to Stockport. Mormon missionaries, including Brigham Young, founder of Salt Lake City, and second President of the Church after Joseph Smith, were active in this area as early as 1837. A number of converts emigrated from Stockport to the Mormon state of Utah, including Eliza Burgess who in 1850 became one of the wives if Brigham Young; others formed a group in Stockport. 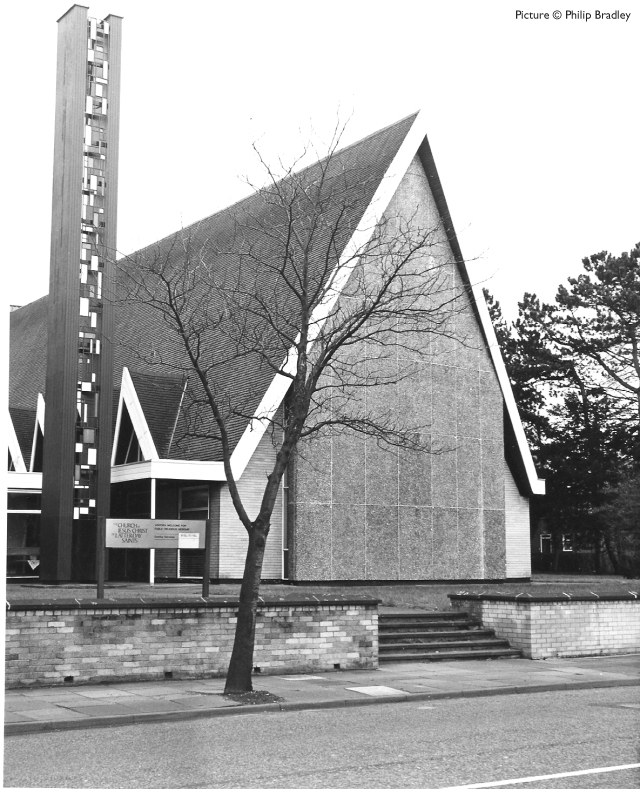 At the time of opening of the Davenport church, the Stockport congregation had 280 members, led by Bishop William A. Bailey, who was in business as a butcher in Heaton Chapel. Working with him were two church councillors, Mr Ronald Regan of Offerton who also acted as janitor and Mr Raymond Lloyd of Reddish. The young volunteers who worked on the building, were Arthur Leonard, Geoff Hanney, Alan Munn, John Mullen, John Passey and David Stunton. At the time, ten American missionaries were in the area, led by Elder Gary Cragun, then a 21-year-old college boy from Utah, and his colleague Elder Boyd P. Firth. Whatever you might think of the Mormons' theology and missionary activity, one thing is sure: without their devotion to family history research which has led to the creation of the Ancestry website, research of the kind reflected in this article would be a much more difficult proposition. Over the weekend of February 22nd  members of the Stockport congregation, in the Manchester area of The Church of Jesus Christ of Latter-day Saints celebrated the 50th anniversary of the Church building in Stockport. 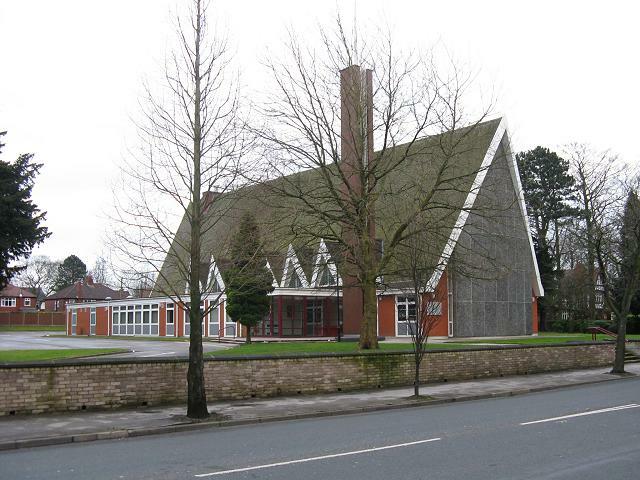 Situated on Bramhall Lane, near Davenport train station, the Church welcomed over 400 members and local residents throughout the weekend. 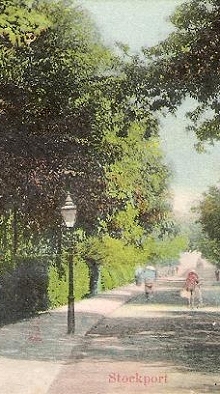 Bramhall Lane from a postcard dated c.1903. 'Beaconsfield' was behind the trees to the left. The scene on Streetview in 2013, with the drive to the Mormon church. There are several people whose cheerful assistance has made this article possible: Jennifer and Mavis Douglas, who have freely shared with me much information from their family history research; Roderick and John de Normann; The staff of Stockport Local Studies Library for their help and for their excellent press cuttings collection; and the attendant at Stockport Cemetery who went beyond the call of duty to help find Isaac Linney Leigh's grave on a cold and wet day. 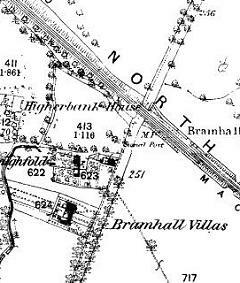 Judith Fell of Bramhall clarified the story of the Bramhall houses. For information about Alice Ann Leigh, thanks to Geoff Royle's website. To Sue Bailey, thanks foir the photograph taken by her late father. In Malvern, thanks to Jeremy M. Hardie and Chis Moir. The mansion named 'Beaconsfield', 269 Bramhall Lane, was one of the first houses to be built in Davenport as the settlement slowly developed around the railway station. It stood on the site of the present-day building Church of Jesus Christ and Latter-day Saints, and was a typical home for a wealthy family in the mid-Victorian period. The picture above shows, according to a note on the back of the print the 'Conservatory connected with Library. Peach house and orangery not shown.' Presumably the lady with the dog is Mrs Leigh. Before the arrival of the railway, there was a farmhouse known as Mile End Farm, alongside the main Stockport - Buxton road near where the gates of Davenport Park estate are today. The land of the farm included the fields either side of Bramhall Lane in the area shown in the picture. 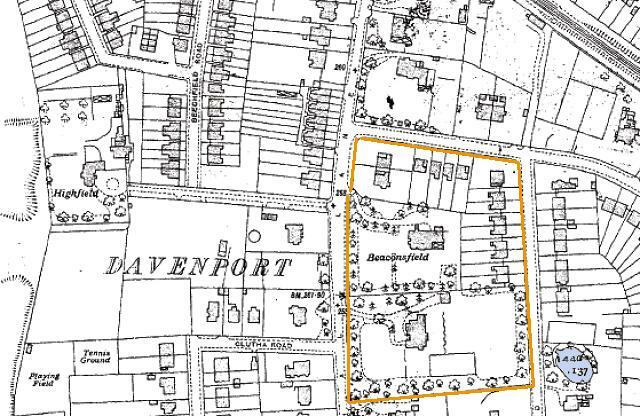 The land was owned by the Davenport family of Bramall Hall, and until 1901 the area south of Kennerley Road was part of the Township of Bramhall. After the railway opened in 1857, cutting across the farmland, they began to sell plots in the area for housing. The development began under the aegis of Colonel William Davenport Davenport, and had proceeded slowly by the time he died in 1869. His son and heir was under age, and it was his executor and son-in-law Frederick Williamson who sold four adjacent plots in 1876 to William Henry Brown, who was probably the Stockport-based builder of that name. The map above is dated 1898. The house near the top right-hand edge is 'The Alders', later renamed 'The Paddocks' which has its own feature on our site. For developments on the empty site to the east, see our article Jesse Lumb and The Crescent. Brown incorporated all the land into the grounds of a new large house, which was named 'Beaconsfield' perhaps inspired by the title of Earl of Beaconsfield conferred in 1876 to politician Benjamin Disraeli. Whether Brown lived in the house for a while, or rented it out immediately, is obscure, but by the time of the 1881 Census it was the family residence of Edward Carrington Howard 'retired cotton manufacturer and J.P.' - the son of cotton mill owner Cephas Howard of Brinnington Hall, Stockport. 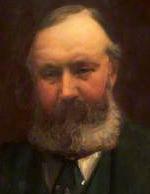 (Portrait, from a painting in the Stockport Council collection.) Soon afterwards, Howard moved his family to 'Poynton Birches', and large house in the village of Poynton a few miles away, where he died in 1886. In 1880 William Henry Brown sold the house and land to Samuel Scott, a Manchester linen manufacturer, whose intention was to settle it on his youngest daughter Frances Anne Scott who had married Isaac Linney Leigh in 1877. After living for a while in in a house on the main Stockport - Buxton road in Heaviley, Stockport, with Isaac's sister Elizabeth, the couple moved in to Beaconsfield in 1882, and by 1891 the census shows children Dorothy Linney Leigh (aged 9), Winifred Scott Leigh (7), Malcolm S. Leigh (5) and Ronald Linney Leigh (2) looked after by governess Elizabeth Matthey and nurse Maguerite Stahli, both from Switzerland. Waitress Jane Warhurst was from Wormhill, Derbyshire and cook Margaret Camlin (?) from Surrey. 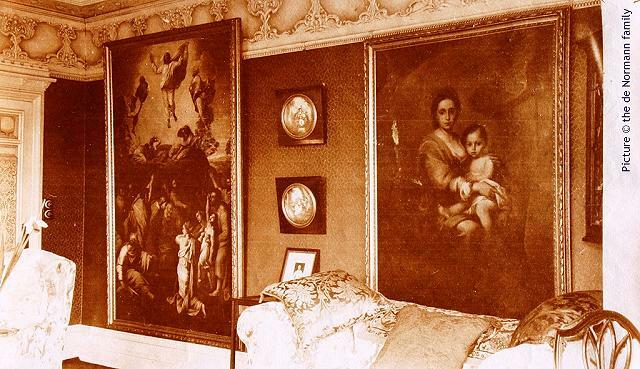 The picture above shows the drawing room in the Leighs' time, with a painting of the Ascension of Christ in evidence. He was prominently connected with the Wesleyan body in the town, being a circuit steward of the Stockport Trinity Circuit, and took an active interest in the lay preachers. He was also a trustee of the Edgeley Working Men's Institute. In later years he became a Roman Catholic. At one time he was a Liberal, but afterwards became a Liberal Unionist. He was appointed a Magistrate of the Stockport county division in 1885. Sadly, all did not go well at Beaconsfield. In 1896, eldest son Malcolm Scott Leigh died, aged 10, in Conway, Wales. By 1898, due to 'unhappy differences which had arisen between them' Frances and Isaac were living apart, Isaac having moved to a house (still in existence today) named 'Lyndhurst' in Park Road, Buxton. The problems unfortunately came to public attention when the newspapers reported a case in the Chancery Court for Lancashire, held in Liverpool in July 1898. Although the house belonged to Mrs Leigh, her husband owned most of the furniture and proposed to sell it in an auction sale to be held at over two days at 'Beaconsfield' where Mrs Leigh was still residing. He had even placed an advertisement for the sale in the Manchester Guardian. Sir Joseph Leigh and Joseph Grundey, two trustees under the marriage settlement, appointed a lawyer to apply for an injunction to prevent the sale, and this was granted by the Vice-Chancellor. The 1901 Census shows Isaac living at 'Lyndhurst' with children Dorothy, Winifred and Ronald, whilst Frances remained at 'Beaconsfield' with younger children Gladys Marjorie (then aged 9), and Phyllis Stephanie (4). These pictures from the family collection show Isaac Linney Leigh and Frances Anne Leigh. The portrait of Isaac appears to be taken quite late in his life. Tragically Isaac suffered what his obituary describes as a 'breakdown' and became an housebound invalid. He returned to live with his wife at 'Beaconsfield' where the 1911 census has the couple together again with Ronald (22) and Gladys Marjorie (19). Of their seven children, three had died by that date, as recorded on the family grave - see below. 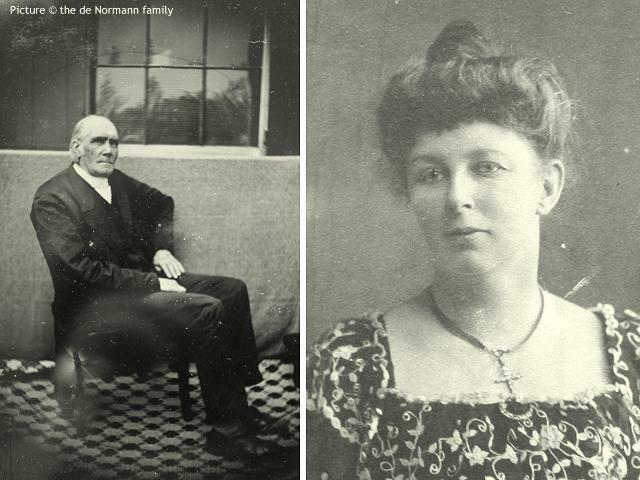 The team of four servants in 1911 included a man named George Stroud, described as a 'nurse' - a full-time carer for Isaac - as well as married couple William and Annie French as butler and cook, and housemaid Clara Heatley. The census return was completed by Frances, which hints at the condition of Isaac at that time. If this sad story of marriage breakdown, child mortality and sickness tells us anything, it must be that money does not always buy happiness. Online records can give odd glimpses of people's lives, and one such is a 'manifest of alien passengers' on the arrival of the the liner Lusitania in New York on 26 February 1910 which includes Frances A. Leigh of Beaconsfield, Davenport, giving her final destination as Los Angeles, California. An adventure to get away from the tragedies of home, perhaps. Her daughter Gladys Marjorie also travelled: a 1912 passenger list has her arriving in London from Las Palmas, Canary Islands aboard the the Union Castle liner Guildford Castle. Isaac Linney Leigh died at Beaconsfield in October 1914, and after a funeral at the Roman Catholic Church of Our lady and the Apostles in Shaw Heath was buried in Stockport Borough Cemetery. The simple family memorial, which stands near to the ornate family vaults of other wealthy Stockport families, is pictured above in 2013; the red granite looks almost new, although the infill of the lettering has faded making it hard to read. The map above is from 1910. Houses have now appeared on Egerton Road, and new streets to the west of Bramhall Lane. In 1915 a new indenture (a document which recently came into our hands via an eBay auction: download a PDF transcript) was drawn up appointing two new trustees, Isaac's son Ronald Linney Leigh and lawyer Edwin Russell Hopwood in place of Isaac himself and his half-brother Joseph who had died some years earlier. Soon afterwards, the house and land were sold to James Hampson Stansfield, who in 1911 was living at 36 Davenport Road in Hazel Grove, and described himself as a pawnbroker. It appears he invested his profits in property; there are records of his ownership and sale of buildings elsewhere in the area. Documents relating to the sale have survived in the care of Isaac Linney Leigh's descendants, which reveal that the purchase price was £3600, perhaps equivalent to £300,000 today. Stansfield paid £900 deposit, and obtained a mortgage for the rest. In February 1915 an auction of 'sundry furniture at Beaconsfield' raised £54.13s.3d. Another interesting note is that 'the corporation wanted to tale part of the frontage of Beaconsfield but the Local Government Board has forbidden corporations everywhere to borrow further monies due to the war so the matter is off.' 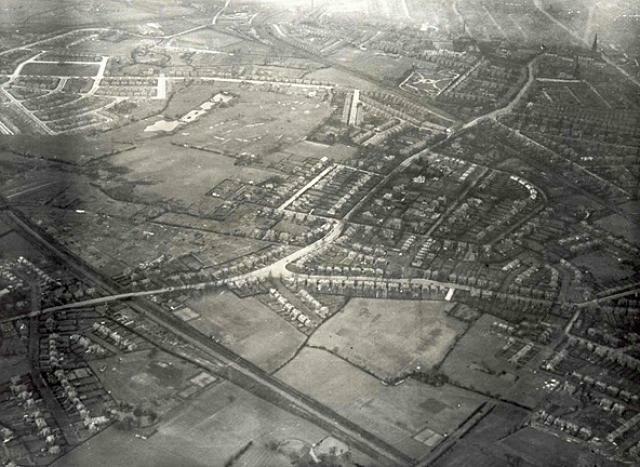 The proposed widening of Bramhall Lane did eventually take place, in the late 1920s. Dorothy Linney Leigh, the eldest daughter, left Britain for Canada, and in 1912 married Cheshire-born engineer Henry Jackson Tippet (son of an 'East India Merchant') in Vancouver. In 1916, with their daughter Joan, they relocated to the United States, settling in New Haven, Connecticut where Henry became the Secretary and Treasurer of the Connecticut Society of Civil Engineers. Henry and Dorothy both became US Citizens, although not until 1940 in Dorothy's case. Dorothy died in Florida in 1970. During the research for this feature, interesting information about the later lives of the Leigh family came to light. 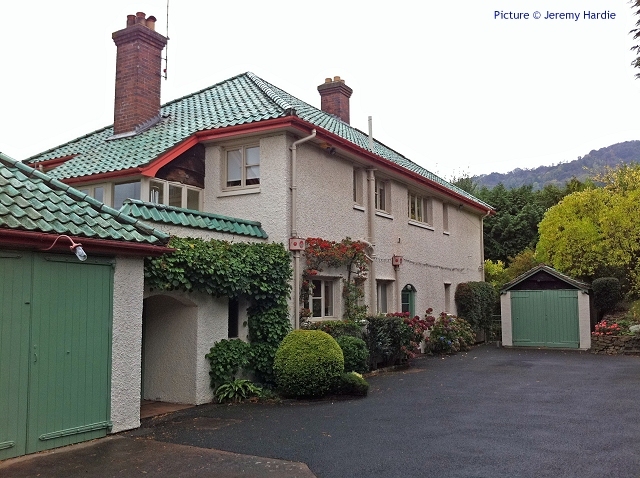 Isaac's widow Frances relocated the family to 'Greyroofs', Peachfield Road, Malvern Wells, Worcestershire (pictured above) a house designed by Arthur Troyte Griffith (1864-1942). Griffith was a Malvern-based architect and a friend of composer Edward Elgar; One of Elgar's 'Enigma Variations' was named after him. 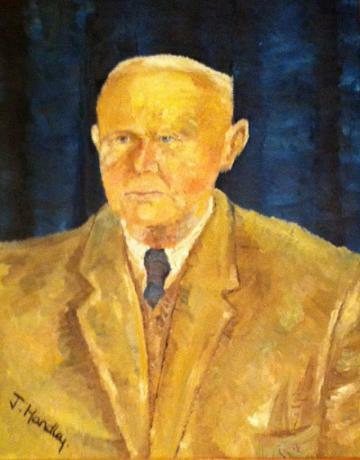 He was the Secretary of Malvern Concert Club and also a watercolour painter. As an architect he worked mostly in the Malvern area; his life and work have been studied in detail by local historians, initiated by the late Catherine Moody and culminating in an excellent book by Jeremy M. Hardie, Troyte Griffith: Malvern Architect and Elgar's Friend published in 2012. 'Greyroofs' was an early deign by Griffith, completed in 1909. It is said that it was built for 'a wealthy German count. However the 1911 Census shows it to be the home of retired engineer Gerald Barker, his wife Ethel and their servants. Winifred Scott Leigh lived at 'Greyroofs' until 1921 when she married Eric Norman de Normann (1893-1982). De Normann was a civil servant at the Ministry of Works in London; he had risen to the post of Deputy Secretary by his retirement in 1954, after which he was appointed Chairman of the Ancient Monuments Board. He was a interesting character about whom much more could be written. They lived at 'Aylesham', Weybridge, Surrey had one child, John Anthony de Normann (born 1923) whose elder son Roderick de Normann (born 1960) served in the British Army, and is the author of a number of books on Military History. Roderick and his father John have been of great assistance in the creation of this article. Winifred died in 1968. Frances Anne Leigh died at 'Greyroofs' on 25 March 1931, leaving effects to the value of £3552, 8s 1d. Her two children who had moved with her to Malvern: Ronald Linney Leigh and Gladys Marjorie Scott Leigh (known as Marjorie) sold 'Greyroofs' which was later divided into two separate residences, and commissioned Arthur Troyte Griffith to create a new, modern house, lower down Peachfield Road at No.38. They it named 'The Orchard', as it remains today. Marjorie never married; she died at 'The Orchard' in 1968. Ronald Linney Leigh applied to join the Royal Navy in World War I, but did not pass the medical examination and so joined the Merchant Navy. In 1919 he was serving as Purser on the Royal Mail Ship Pembrokeshire which plied between England and the River Plate in South America. He was awarded the Marine Mercantile Ribbon in 1919 and the Marine Mercantile Medal in 1923, when his residence was 'Ray's Bungalow', Lock Mead, Maidenhead. He is remembered in the family as 'the most lovely man'. He married, had a daughter and then divorced. He died at 'The Orchard' on 25 August 1978, and in his will left everything to his housekeeper. Not long before his death he wrote a letter local historian Catherine Moody, who had appealed in the local newspaper for owners of Griffith-designed houses. He wrote that both 'Greyroofs' and 'The Orchard' were built by W. James and Son of Upper Colwall, and that Griffith visited frequently during the construction work. The portrait reproduced here was painted by the wife of a very good friend of Mr Leigh’s, Dr J Handley, who lived next door to 'The Orchard.' It is now in the possession of the current owners of the house. Thanks are due to Jeremy Hardie and Chris Moir for their generous assistance with this section. The next known occupier was Percy Carter Taylor, a shipping merchant. A letter to Mrs Leigh from estate agent Mr Hopwood shows that Taylor agreed (after some negotiation) to rent the house for five years (with an option for a further five) at £120 per year. He appears on the electoral register for 1918, which the lists the house as 269 Bramhall Lane. Born in Bolton in 1867, he previously had lived with his wife Beatrice, and stepson Walter Hodgson Grey at 'Dunedin', 28 Davenport Park Road, not far away. He was a partner, latterly with his son, in the firm of Ledward and Taylor, in business at 60 Bloom Street, Manchester. 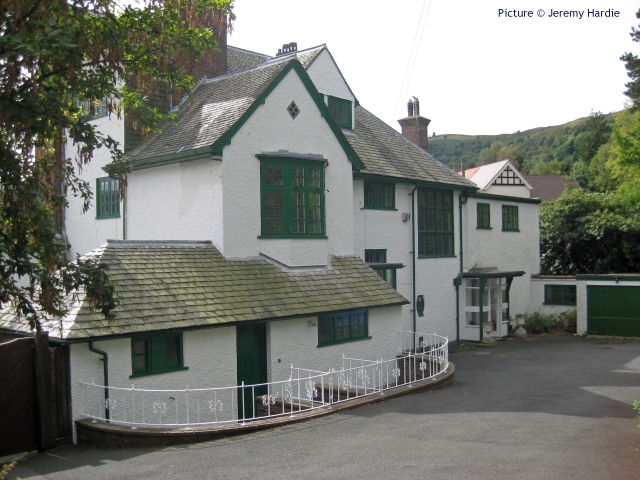 He stayed at 'Beaconsfield' for a few years before moving by 1924 to Park Mount, Ivy Lane, Macclesfield where he died in 1931, the year after the business was dissolved. In 1923 the large field that formed the southern part of the grounds was sold by James Hampson Stansfield to William Ewart Clucas, for whom was built the large house 'Reinbek' which still exists as a care home and forms the subject of another article on this site. Also in 1923, Beaconsfield and the remaining grounds were sold by Stansfield to Arnold Percy Watson, who we believe was in business in Manchester as a shirt and collar manufacturer. Under his ownership plots were sold for development on the north and east side of the grounds. By 1930, the house 'Beaconsfield' appears to have been abandoned; nobody living there was recorded in the Electoral Registers for that year, or any subsequent ones. It does seem to have remained standing, though. 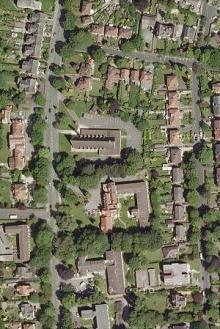 It appears to be present, surrounded by the new smaller houses, in an aerial photograph dated '1930s' held by the Stockport Image archive, reproduced here. The Ordnance Survey map dated 1962 shows an empty plot. Does any reader know when it was demolished? 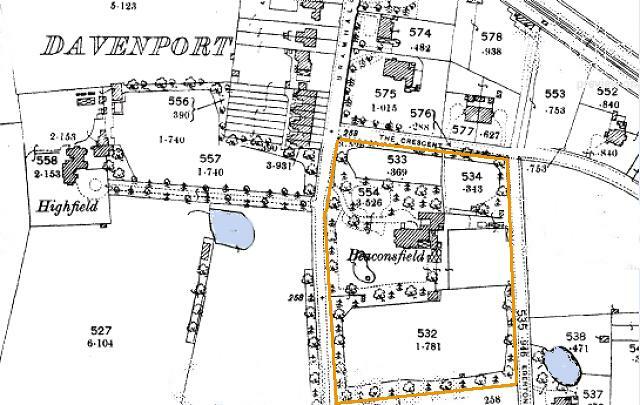 Our final map is from 1934, and shows 'Reinbek' and also the housing developments in the grounds of 'Beaconsfield' which left it with a much smaller, but still sizeable, area of garden, the area still commanded by the Church which stands there today. The outbuilding on the north side of the house, has disappeared, along with most of the glasshouses. Later, the owners of 'Reinbek' also sold land for housing along the Egerton Road perimeter of their grounds. A 70ft. spire on Bramhall-lane Davenport, will be a new landmark in Stockport next year when the no-labour-cost £41,000 chapel of the Mormons - The Church of Latter-Day Saints, from America - is expected to be complete. The Stockport branch of 150 members will fund over £8000 of the cost and will provide food, shelter and pocket money for volunteer builders from all over the country. 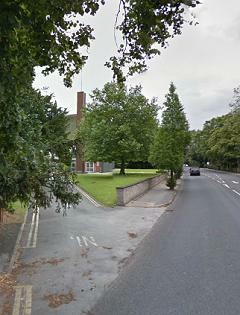 The chapel, of modern design and providing seating accommodation for 520 by removal of internal partitions, will be sited at "Beaconsfield", Bramhall-lane. Besides the chapel, their will be a hall, lounge and classrooms for the Sunday School. The volunteer labour force give up their jobs for two years as their contribution to the church. The Stockport church meets at the Textile Hall, Stockport, but has recently been given notice to quit. Nearest chapels are those at Manchester and Wythenshawe. The picture is from a newspaper of August 1962, showing the volunteers hard at work. 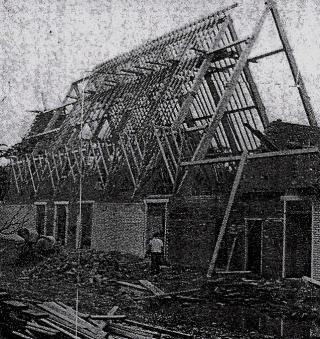 Supervising the construction was church elder Myron Neuffer (1900-1976) who left his building business and 400-acre farm in Montana for nearly three years to come to Stockport with his wife. The spire, with its stainless steel pinnacle, gained much attention when it was craned into place in 1963, under the direction of Mr. Wroe, of the timber engineering works of William Kay of Bolton, with a crowd of people and TV cameras in attendance. The building opened in February 1964, by which time its quoted cost has risen to £70,000. The individual people in this press picture of the opening ceremony are not identifiable from the article which it accompanied, but they include the local church leaders and the volunteer builders who were each presented with an illustrated edition of the Book or Mormon by the President of the Manchester "Stake" of the church, William Bates. We would guess that the gentleman third from left on the front row is Mr Neuffer, with his wife alongside. The picture above, taken by Philip Bradley in the 1980s, shows the building in its original condition. It stands in 2015 (as pictured above) and is 'locally listed' as a building of historic interest, and appearing very much as it was built, although in the 2000s the tower, dormers and other features were renewed to the same basic design but with different, less colourful, decoration in the tower. 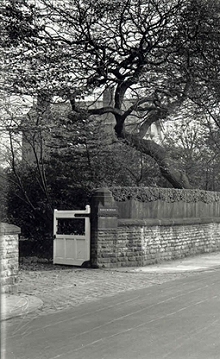 The church authorities have in the past applied for planning permission to erect a fence around the building for security reasons due to 'increased youth activity' but so far, consent has been refused on the grounds that 'the proposed fencing and gates to the Bramhall Lane frontage, by virtue of their unsympathetic siting and design would fail to preserve or enhance the character or appearance of the Egerton Road/Frewland Avenue Conservation Area'. Written by Charlie Hulme. Updated May 2015.